Bio: Chin-Cheng Hung was born in Keelung, Taiwan, in 1966.He has devoted his attention to the study of Chinese art since he was 12. He received his Diploma of Art, Fu Hsing Kang College, Taipei, Taiwan. In 1997, he came to the United States to pursue his MFA degree in painting at the Savannah College of Art and Design after a long career as a serviceman. Here he also established his teaching career in the Foundation Studies since 1999.Hung is a signature member of the Pastel Society of America, member of the Southeastern Pastel Society, the Atlanta Chinese Art Association, the College Art Association, and member and former President of the Chinese-American Academic and Professional Association in Southeastern United States. His biography was selected to be listed in the newest editions of Marqus Who's Who in the World, Who's Who in America, Who's Who in American Art, and Who's Who among American Teachers and Educators. Hung has received numerous awards from different juried competitions and has been featured in The Pastel Journal, Pastel Artist International, International Artist, and New American Paintings. Navigation: Main menu remains on side. Image View: Galleries contain large thumbnails that enlarge again in new window when clicked. This is where the information is available on medium and dimension. Enlarged images may be saved. 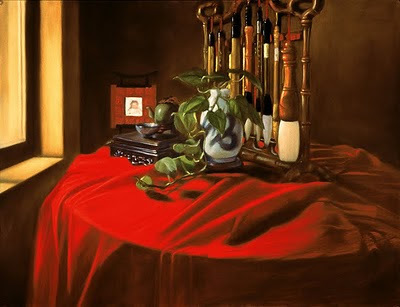 Simple Red is one of his few still life paintings, 25.5 x 19.5 ins, 720x552, 416 KB.